We should have laughed when we thought our problems were over after the baggage issue. There was virtually no wait to go through security at the cruise terminal, and Jonathan and I flew right through the steps to get your entry card for the ship. However, Ebad got detained for about an hour while they called several agencies to verify the status of his visa and whether he was eligible to sail. In the end, he got the OK (we knew he would, they just need to familiarize themselves with the policies of internationals, really), and we got on the ship. We took a pretty good embarkation photo, and proceeded to get some lunch. We did the deli and the buffet. The grilled ham and cheese was excellent (always is on a ship! ), and the guys liked the reubens, too. Nothing spectacular on the buffet, but nothing was bad, either. Then, we checked out our rooms. It was really nice to have them directly across the hall from one another. Last time we were on the same floor but about 30 rooms apart and around a corner. This made a big difference, since we could open our doors to signal we were ready to go to the next activity, or just keep them open and wander back and forth as needed. Totally would do this again. We did some exploring and made our way up to Deck 12 (we were on 7), for the 3pm spa raffle. They always raffle off some spa treatments, and I always enter. I've never won, but I've gotten discounts before (still haven't used any... but someday!). After that, we headed down for the "safety briefing" which was pretty quick. We didn't even have to don our lifejackets like we do on some of the ships. Then it was time for sail-away, so we grabbed some drinks for take-off. Our luggage arrived at our rooms shortly before 5pm, so we unpacked a tad and then separated for a bit. I went to the shopping talk for Nassau (I almost always go to these, since you get great advice on souvenirs, plus coupons for discounts and free items in various stores), while the guys checked out what the casino had to offer (Ebad is pretty good at blackjack. 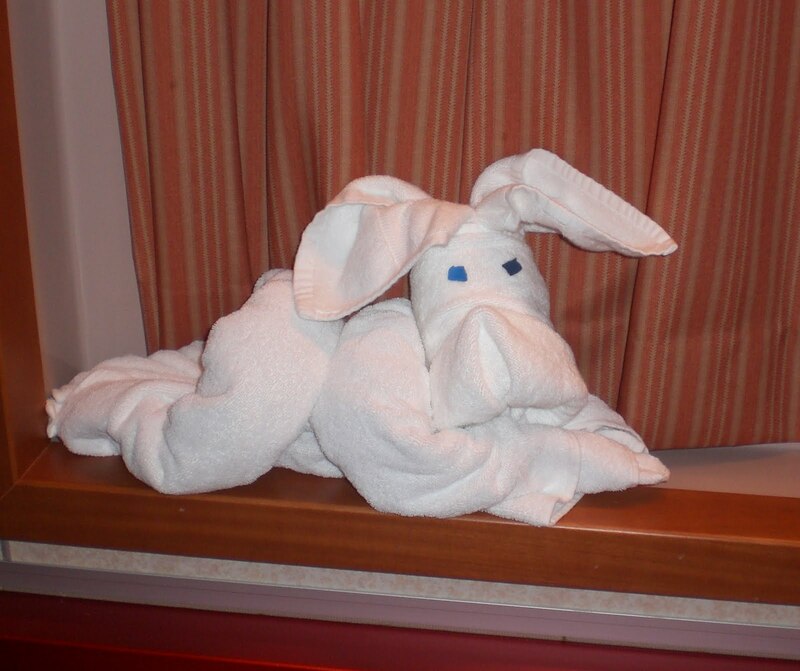 On our last cruise he made back all of the money it cost him to go!). We met back up a little after 6pm and had some sushi (which was conveniently located just off the casino, LoL). Nothing spectacular, but the shrimp nigiri was average and the spicy tuna was good... except the spicy was a cajun spicy which was unexpected. The salmon/asparagus/mushroom roll wasn't good. We followed this up by attending the martini tasting. 5 martinis for $15 (decent size, too). I wasn't a big fan of any of them (not a martini person), but I was surprised I didn't like the Nuttini, which sounded great from the ingredients list, LoL! Overall, nobody was head-over-heels for any of them, but they were fun to try. We changed and headed for the dining room. We were seated at a ten-top this time, and four of our tablemates were also from Melbourne! This is incredibly chance, and it was fun to have their company each night. The other two people at our table were from Tampa, probably about our age, and very quiet. The food the first night was scrumptious, as always. Jonathan and Bryan each ordered a cheese plate (and did each subsequent evening as well), which came with brie, gouda, port, bleu, and swiss (I often got their pieces of swiss, LoL), plus some fruits and breads. My starter was the smoked duck, which had a great flavor. Jonathan and I both had the broccoli-cheddar soup, which was very hot. It's not my favorite soup, but it's still pretty good. Pretty much the entire table chose NY strip and baked potato as their entree, but I went with the chicken-pesto-pasta dish, which was also average. The rice I added as a side was fabulous, despite the fact that it was just plain, white, long-grained rice. The guys all went with sherberts for dessert, but I chose the banana split (one of the secret dessert items). The banana split was great, with delicious ice cream, fresh banana, and homemade whipped cream. We also went with espressos all around, which is the norm for me, since they're free at dinner and they give me the pep to keep going all night, LoL. 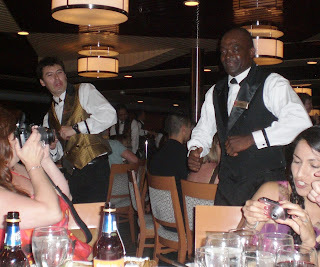 The waiters also dance to a different song every evening, so here's a few pictures of the first night, hehe. 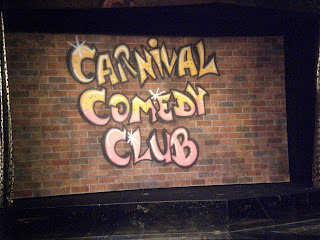 We went back to the rooms to finish unpacking and to rest for about half an hour before heading out to the comedian. Our towel animals had been made while we were at dinner... the first night it was the dog. 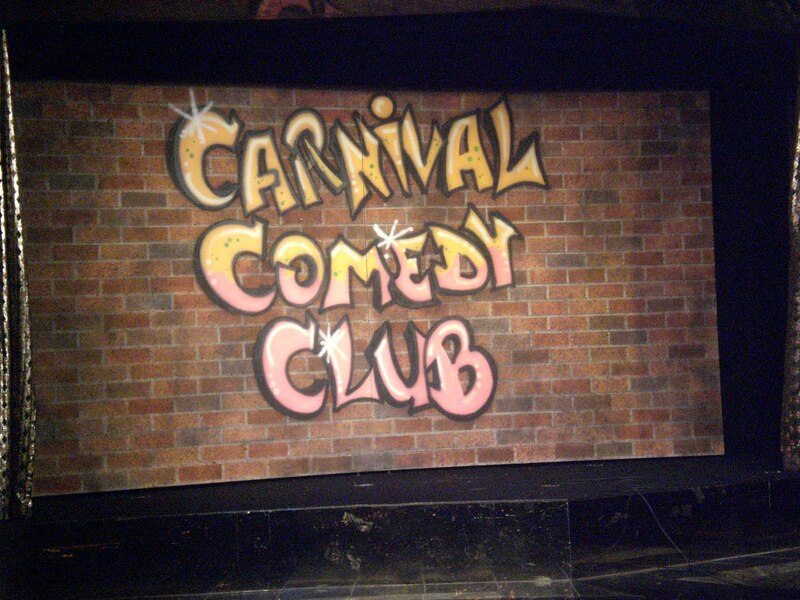 The comedian was Al Romero, you may have seen him on television or whatnot. Most of his jokes were average, but Ebad and Bryan in particular felt he was kinda bad. Afterward, I read a bit and then headed to bed soon after.